Early detection of a bed bugs infestation will not only prevent the spread of the infestation to all areas of your home, but, will also allow you to save money on the treatment of the issue. Bed bugs are pests that feed on the blood of humans. Bites are typically painless in the initial stages, but have the potential to transform into large welts on the skin that may become itchy and painful. Although the bites are considered to be a nuisance among those that experience them, bed bugs are not known to carry and/or spread potentially harmful diseases. In many instances, these pests enter the home unknowingly through luggage, furniture, clothing, and similar items that are infested. Additionally, these small bugs may enter through the tiniest of openings in the home, such as cracks and crevices. In this guide, you will learn the most common bed bugs signs. In addition to this, you will learn about some common treatments that may be used to combat a bed bugs infestation within your home. It is imperative to detect a bed bugs infestation in the earliest stages; however, until recently, the detection tools and strategies were exceptionally limited. Encasements of mattresses and box springs were the very first type of detection tool available to individuals. Today, many more are now available. Examples of these tools and strategies include the canine scent method, the CO2 monitors, as well as interception devices that are considered to be passive. If you are looking for bed bugs signs, it is important that you understand that there is no one detection tool or strategy that is considered to be 100% accurate and/or reliable in detecting these troublesome pests. As a result of this fact, it is advised that you utilize a combination of tools and strategies to identify an infestation within your home. This is the most productive means of ensuring that you find the pesky little critters within your home and are able to successfully treat for them before they, literally, take over your entire dwelling. When searching for bed bugs infestation, the least reliable method is a visual-based inspection. These inspections are considered to be time consuming and very labor intensive. 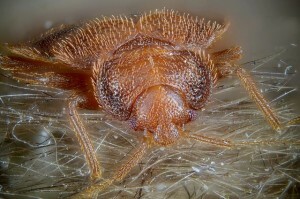 Bed bugs have a very secretive nature. These pests have the capability of hiding in areas that are not considered to be visually accessible. If you use this method, you should learn how to identify a bed bug and their eggs. You should also utilize a high-powered flashlight and a magnifying glass to search for the pests in locations they are most frequently discovered by pest control specialists. These areas include underneath furniture, underneath baseboards throughout the home, and on, in, and around mattresses. As stated in the beginning of this guide, encasements for mattresses were the first type of bed bugs infestation detection tool. By completely covering a mattress and a box spring with an encasement, you will lock down any and all bed bugs living on these items. As a result, they will die. If any are located on the outside of the encasement, you will see them on the encasement and will be able to effectively deal with them immediately. If you are searching for bed bugs signs, you may benefit from utilizing one of the many interception devices available on the market today. These are simple devices that are simply placed in locations where bed bugs frequent. If there is a bed bugs infestation, the devices will intercept their movements and trap them. In addition to finding them in their natural habitats, the interception devices have the ability to prevent an infestation from moving from one region of the home to another region of the home. Most of these devices are considered to be passive. That is, no attractants are utilized in order to draw in the pests. However, there are interception devices that do use attractants to lure in bed bugs. The most common attractants include CO2 and heat. Chemical-based luring attractants may also be used. Bed bugs may invade any type of structure. It is common to find these pests in homes across the nation. If an infestation is allowed to grow, it could become a large nuisance to the individuals that reside within the structure where the bed bugs live. By learning about bed bugs early detection tools and strategies currently available on the market today, you have the ability to uncover an infestation before it gets out of hand. By identifying these small-sized pests with a desire for human blood in the earliest stages of the infestation, you will also find that you are able to save a tremendous amount of money in treating the home so that the pests are eliminated.